While mathematicians describe mathematics as playful, beautiful, creative, and captivating, many students describe math class as boring, stressful, useless, and humiliating. 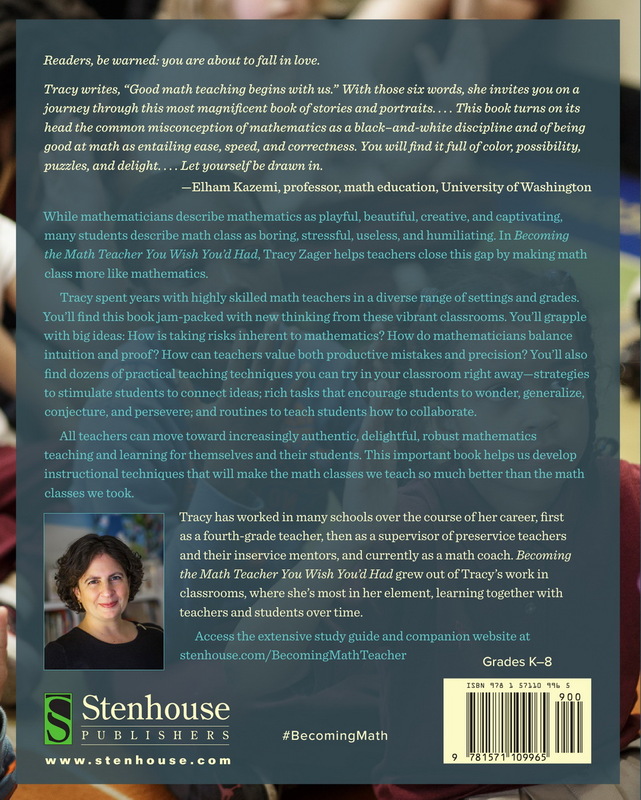 In her new book, Tracy Zager helps teachers close this gap by making math class more like mathematics. Tracy spent years with highly skilled math teachers in a diverse range of settings and grades. You’ll find this book jam-packed with new thinking from these vibrant classrooms. You’ll grapple with big ideas: How is taking risks inherent to mathematics? How do mathematicians balance intuition and proof? How can teachers value both productive mistakes and precision? You’ll also find dozens of practical teaching techniques you can try in your classroom right away—strategies to stimulate students to connect ideas; rich tasks that encourage students to wonder, generalize, conjecture, and persevere; routines to teach students how to collaborate. Readers, be warned: you are about to fall in love. 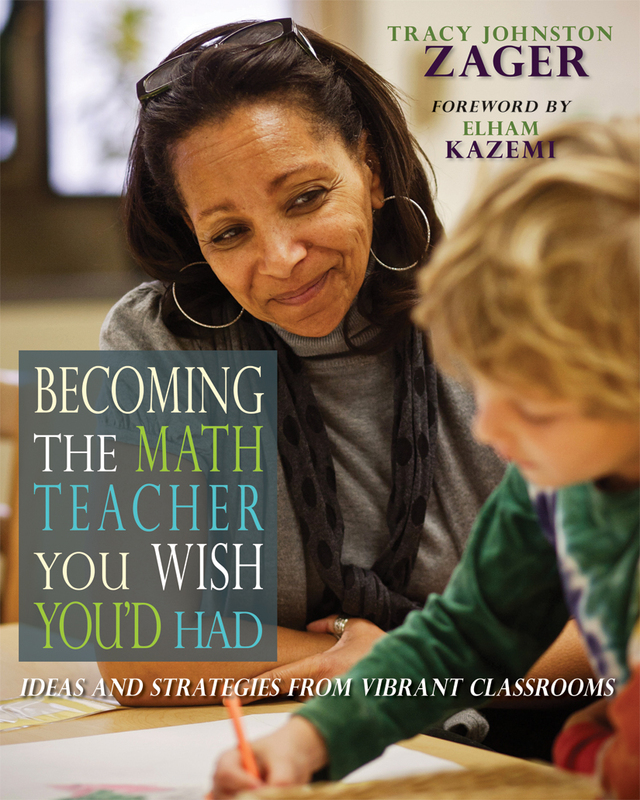 Tracy writes, “Good math teaching begins with us.” With those six words, she invites you on a journey through this most magnificent book of stories and portraits.… This book turns on its head the common misconception of mathematics as a black–and-white discipline and of being good at math as entailing ease, speed, and correctness. You will find it full of color, possibility, puzzles, and delight.… Let yourself be drawn in. Tracy has worked in many schools over the course of her career, first as a fourth-grade teacher, then as a supervisor of preservice teachers and their inservice mentors, and currently as a math coach. Becoming the Math Teacher You Wish You’d Had grew out of Tracy’s work in classrooms, where she's most in her element, learning together with teachers and students over time. Chapter 2: What Do Mathematicians Do? Tracy warns early on that the book is long—and it may be—but it is also captivating! The organisation is immensely practical; each chapter can be used as a self-contained guide for a particular mathematical habit. I can see myself repeatedly delving back into specific habits as the teaching year progresses. What a delightful, enjoyable collection of useful, interesting stories and tips for teachers. I hope millions of math teachers read it and become the kind of math teachers the world needs. I hope to someday be an elementary school teacher who is ready and willing to teach math. Becoming the Math Teacher You Wish You’d Had offers me a sense of hope that I am capable of teaching a more fun and engaging math class for every student. ...a powerful survey highly recommended for any math instructor seeking specific keys to not just teaching the basics, but making math relevant and exciting.